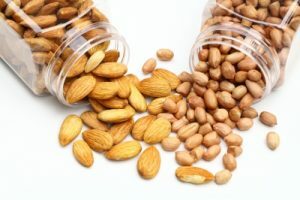 One of the biggest health threats to people living with chronic hepatitis B is a toxic, nearly invisible mold called aflatoxin found in corn, peanuts, peanut butter, almonds, Brazil nuts, walnuts and pistachios. People with hepatitis B who eat food with high levels of aflatoxins face a liver cancer risk that is 60-times above average. In addition to nuts and grains like quinoa, aflatoxin can be found in figs, milk and cheese, soybeans, dried spices and cottonseed. It is less common in rice, as long as rice is hulled, which removes aflatoxin mold. This toxic mold, produced by a fungus that grows in warm, moist climates, is found at high levels in crops grown in rural regions of sub-Saharan Africa, Southeast Asia and China, where food storage and processing is not closely regulated. Unfortunately, these regions also have high rates of hepatitis B infection. Low levels of aflatoxins are considered unavoidable in food and animal feed, even when good manufacturing practices are followed. Most countries, including the U.S., allow low amounts of aflatoxin in corn and peanuts. However, some researchers suggest even these low levels can lead to liver damage in people infected with hepatitis B who rely on diets rich in corn, nuts and grains. The U.S. Food and Drug Administration and the USDA has set “actionable limits” (a maximum tolerable level of aflatoxin) for foods like corn and peanuts in order to limit how much aflatoxin reaches the human food chain and livestock feed. Farmers and food suppliers also try to lower mold contamination by keeping crops from becoming overly moist and warm, harvesting food when it’s ripe before mold can develop, and preventing rodents from spreading the mold before and after crops are harvested. Buy only major brands of nuts and peanut, almond, and other nut butters. Discard any nuts or grains that look moldy, discolored or shriveled. Cook foods to reduce aflatoxin levels: However, aflatoxin mold is not entirely destroyed by cooking, roasting and processing, so small amounts can still remain in peanut butter and many processed products. According to one report, the cooking process and ingredients used to make corn tortillas, however, effectively destroys aflatoxin. Soaking grains and nuts can reduce aflatoxin levels: Studies show soaking grains before cooking and cooking soybeans at high temperatures also help decrease aflatoxin levels. Consume grains and nuts as soon as possible, preferably within one to two months of purchase. Buy produce grown locally, instead of purchasing items shipped from overseas. Studies of organic products sold in the U.S. found their aflatoxin levels to be as safe as commercial products.